2017 is shaping up as an exciting year for rising New Zealand star Michaela Drummond. Following a successful two years on the track at the under 19 level Drummond has signed a professional contract on the road with Visit Dallas DNA Pro Cycling. Having claimed the junior team pursuit world title with a World Record time in 2015 Drummond was the only returning member of the squad in 2016. The young New Zealand team went on to claim silver behind Italy. Before Drummond added a second silver in the omnium to go with her Oceania and two New Zealand titles in the event. An omnium specialist Drummond's increased road focus in 2017 is partly a result of the UCI changes to the event. The removal of the individual pursuit, flying lap and 500m time trial and introduction of the tempo race sees bunch events the focus, with Drummond hoping criterium racing in the US will benefit her as she looks long term in her still young career. Drummond's overall focus remains on the track with the Gold Coast Commonwealth Games a big goal but the 18-year-old is taking it one step at a time. The Oceania Track Championships in December will see her make her elite debut with the New Zealand National Championships, World Cups in February and Hong Kong World Championships also on the horizon in the next six months. Heading in to Junior Worlds this year you were the only returning rider from the team that won gold in 2015 did that give you a leadership role? How important to do you think that will be for the future? Since the 2015 gold winning performance, I did look back and think about what made the team so successful and I would have to put it down to Bryony Botha and Holly White having been to the 2014 World Championships and already knowing what to expect I felt they both brought a lot to the team. I remember them taking their knowledge forward and expressing it to Madeleine Park and I. So when it came to the 2016 Championship I knew that the knowledge I had from last year would help build confidence in the team. I also wanted to step up as a rider off the bike and become a role model, or a person you can come talk to about anything. Raced Italy in the final who had broken the World Record at the European Championships a week earlier how did the final go for you? Happy with how the team raced? Racing Italy didn't faze me too much even with their new World Record. This was because I had confidence in my team that we could ride faster as we had already done so in training. I had a really strong team and for us to win we just had to follow the process but sometimes things happen that we can't control and the process changes. So to say the least I'm am so so so happy with how the team rode after the crash in the final. We only had three riders from very early on and we rode our hearts out. I feel that was something to be very proud of even if the end result isn't what we wanted. You had a consistent omnium finishing top four in the first five events to sit second ahead of the points race. Claimed silver in the omnium after closing the gap to the winner Elisa Balsamo and holding off a late run from Maggie Coles-Lyster how did the omnium go for you? The omnium started off really well for me with the scratch race and pursuit being my best events in the championships but as the omnium went on my confidence started creeping downward slightly as Elisa's points kept creeping upward nearer and nearer to the point where I would have to take a lap in the points race to gain the overall lead. Sadly in my mind I gave away the opportunity of trying to win rainbows, my mindset changed to consolidating second rather than putting second on the line to take first, which I think is something I would rather have done. If I could go back I would do a few things a bit differently in that points race. But I'm happy I can say that, because the Junior Worlds is all about experience and I got the experience I need to move forward as an elite. Rainbow jersey from last year in addition to New Zealand and Oceania titles happy with your two years in the under 19 category? Happy would be an understatement I'm so over the moon with the two years I've spent in under 19. I have achieved so much as a person and learnt so much about myself as a rider that I can take forward into the future. 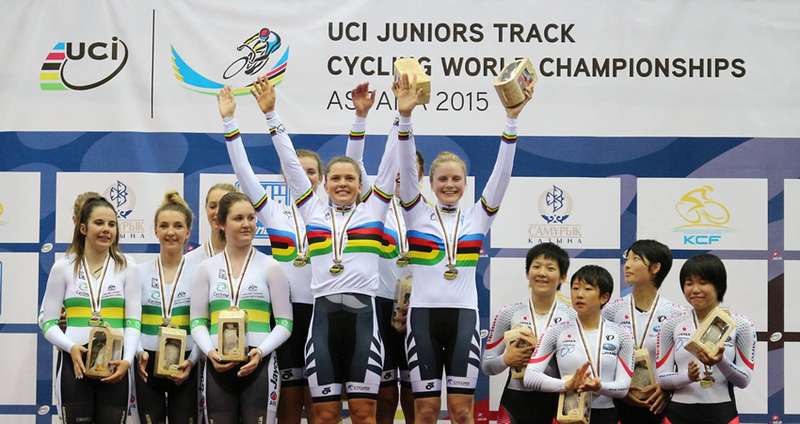 Went to Junior Worlds chasing another rainbow jersey but came away with two silvers was there disappointment? Did you find it difficult to deal with? I was disappointed at the beginning because if the women's team had won gold the whole NZ team would have come home with a rainbow jersey but then I thought about the whole journey and how far the team has come and how far I've come and the good things outweighed the disappointment. While not the result you were hoping for do you think in the long run how you dealt with it and what you learnt will help you improve and develop? Most definitely, in the long run I feel that I will be better off because I've learnt to deal with disappointment. Also I feel because I didn't win I did a lot more reflecting on my performance and what I need to improve on in the near future. If I had won the rainbows, I don't think I would have taken the time to really think about things to improve on in the future. A result is awesome to have but the experience that you gain is more important in the long run as a junior athlete. Signed with Visit Dallas DNA Pro Cycling for 2017 and will spend the year racing in the United States how did the contract come about and what are you most looking forward to about turning a professional? After the omnium change I sort of looked at my options and what would be best for me in the long run. I saw that the omnium only consisted of bunch events and what a better way to improve them then going racing overseas and gaining more experience. Also had discussions with a UCI team in Europe what made you decide to go with racing in the US and Visit Dallas DNA? I felt that Visit Dallas DNA had my best interest at heart. They know it would be my first year out of the juniors and it will be a big step up. I just felt extremely supported by them with my track commitments as well. Also racing in America means lots of crits, which is what I'm best at. Europe would have been a harder transition with the language barrier etc. Having a greater road focus next year but the Commonwealth Games on the Gold Coast on the track in 2018 remains a big focus for you? Yes, huge focus for the future but I just want to focus on a step by step process to get there so it doesn't get too overwhelming. Oceania Track Championships coming up in December, which will be your first race in the elite category what are your goals? My goal is to just learn from the elites. I'm going to try my best and see where I fit amongst the best. Once I get into camp next week my goals will become a lot clearer. Looking a bit further forward in the track season what are your plans for the rest of the track season? At Elite Track National I want to have some really good rides to prove a spot into a World Cup or elite worlds team. That's my main focus coming through the next few months. The step up from juniors to elite is different for everyone what are you most looking forward to and what do you think the biggest challenge will be? I'm looking forward to challenging myself a lot more on and off the road coming into the elites. An elite rider to me means becoming more professional. So being able to keep up with a higher demand of training and finding the balance with University and social life/commitments. So although I am most looking forward to this step up I know it's going to be my biggest challenge. Omnium has been a big focus for you with two New Zealand titles, Oceania title and World Championship silver. UCI has recently announced some big changes taking out the timed events and adding the tempo race what are your thoughts on it? Disappointed at first as I had worked so hard on my timed events this coming year and it really showed an all round best track cyclist if you ask me but I love bunch racing it's always been my strongest discipline. The tempo race though is something a bit different and I haven't quite worked out how to tackle it. Women's Madison has also been introduced are you looking forward to a chance to race to race it? This would have to be the coolest change as I've always wanted to race a Madison and I could never understand why women didn't have it as an option. It's such a good change for women sport and I really want to focus on racing this event in the near future.